“In effect, the Fermi LAT analysis compresses the theoretical box where these particles can hide,” said Jennifer Siegal-Gaskins, a physicist at the California Institute of Technology in Pasadena, Calif., and a member of the Fermi LAT Collaboration. Earlier today, she discussed the latest results of space-based dark matter searches in an invited talk at a meeting of the American Physical Society (APS) in Atlanta, Ga. In addition, many dwarfs lie far away from the plane of our galaxy, which produces a broad band of diffuse gamma-ray emission that stretches all around the sky. Selecting only dwarf galaxies at great distances from this plane helps minimize interference from the Milky Way. “The fact that we look at 10 dwarf galaxies jointly not only increases the statistics, but it also makes the analysis much less sensitive to fluctuations in the gamma-ray background and to uncertainties in the way the dark matter may be distributed around the dwarfs,” said Maja Llena Garde, a graduate student at Stockholm University in Sweden and a co-author of the study. For any given properties of a dark matter particle, the distribution of the particles has a significant impact on the expected gamma-ray signal, a wrinkle that often is handled inadequately, if at all, in previous studies. The motions of a dwarf galaxy’s stars trace out the profile of the massive dark matter halo in which they’re embedded, but these tiny galaxies often have very few stars to track. The result is uncertainty in the way dark matter is distributed along the line of sight to the dwarf, which affects the expected flux of gamma rays detected by the LAT. By addressing uncertainties in the dwarfs’ dark matter profiles, the LAT team’s results are among the most accurate. “An important element of this work is that we were able to take the statistical uncertainties from an updated study of the dwarf stellar motions and factor it into the LAT data analysis,” said Johann Cohen-Tanugi, a physicist at the Laboratory of the Universe and Particles at the University of Montpellier 2 in France and a member of the research team. “This treatment constitutes a significant step forward, and we hope that future studies will follow our example,” noted co-author Jan Conrad, a physics professor at Stockholm University. The team is in the process of following up the two-year analysis with new ones that will incorporate additional Fermi observing time, improvements made to the LAT’s sensitivity and the inclusion of higher-energy gamma rays. 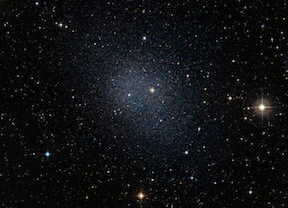 Additionally, sky surveys now ramping up may discover new dwarf galaxies that can be included in future studies. Other members of the LAT Collaboration presenting APS talks on Fermi’s dark matter work include Alex Drlica-Wagner and Elliott Bloom, both from the Kavli Institute for Particle Astrophysics and Cosmology (KIPAC), jointly located at SLAC National Accelerator Laboratory and Stanford University, Calif.
On Tuesday, April 3, William Atwood, a physicist at the Santa Cruz Institute for Particle Physics at the University of California Santa Cruz, will deliver his APS prize lecture on the development of Fermi. Atwood was the originator and principal architect of Fermi’s LAT. He also played a role in shaping the alliance of physicists from the U.S., Europe, and Japan that forms the LAT Collaboration. For his leading work on the design, construction and use of Fermi’s Large Area Telescope, the society awarded him its 2012 W. K. H. Panofsky Prize in Experimental Particle Physics.